CDInfo is a very basic program which provides you with details about a disc which has been inserted. It supports CD, DVD and Blu-ray discs. The information CDInfo provides is all listed neatly in the main application window. 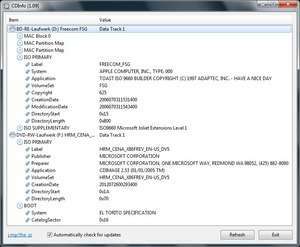 The application supports a number of different details including information about audio discs, whether or not discs are bootable and the label of the disc present. Version 1.13 is a freeware program which does not have restrictions and it's free so it doesn't cost anything. For security reasons, you should also check out the CDInfo download at LO4D.com which includes virus and malware tests. Additional screenshots of this application download may be available, too.